The high speed train from Cordoba to Nice stops in Barcelona and while we were on our way to Nice for a 5-week housesit we first spent three-nights in Barcelona the last week of March. 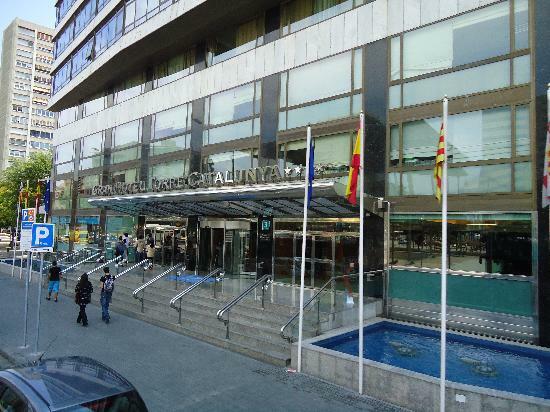 We chose the Hotel Torre Catalunya (tallest building in the pic above) because of its proximity to the Barcelona Sants train station. 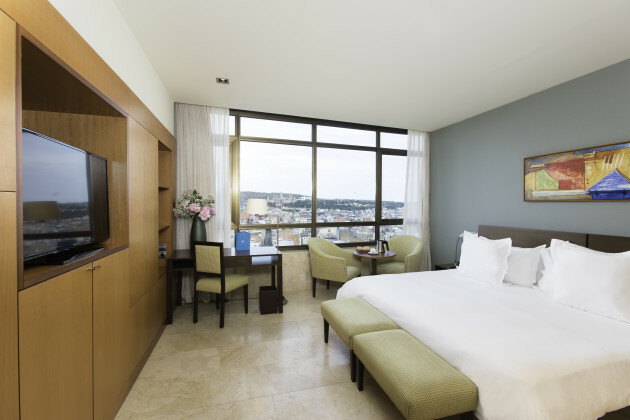 A short 4-minute walk, it is also within easy walking distance of the downtown core and many of the city's major tourist attractions. 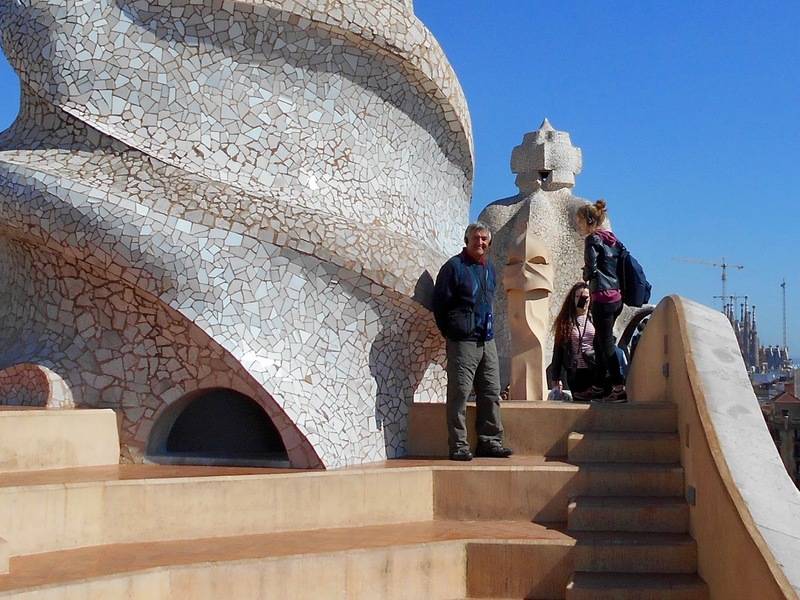 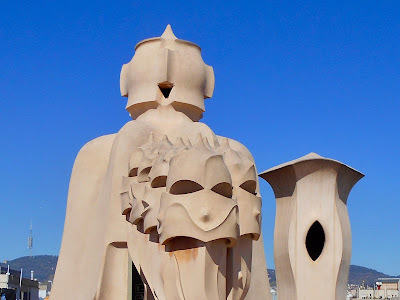 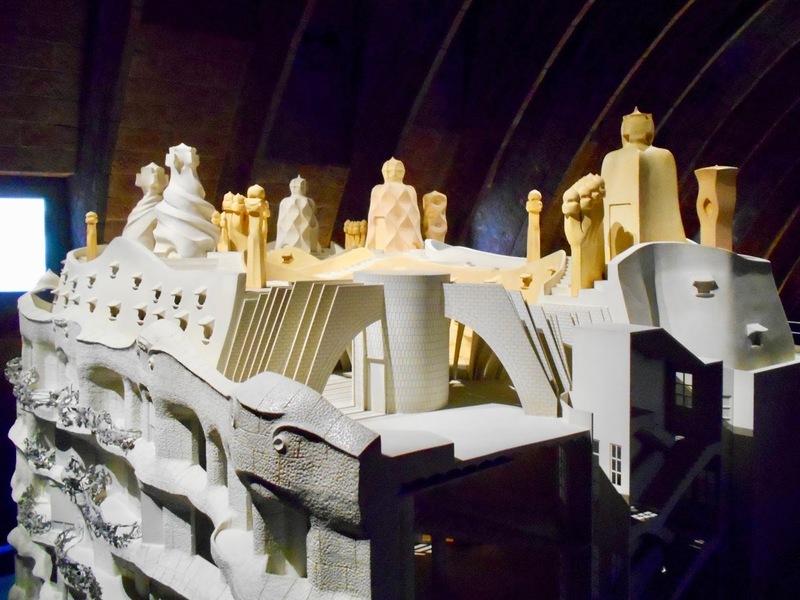 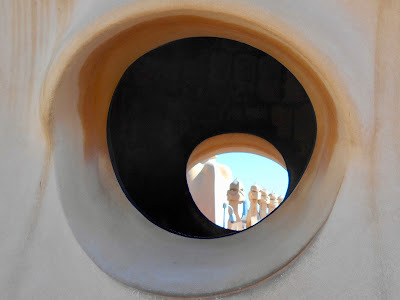 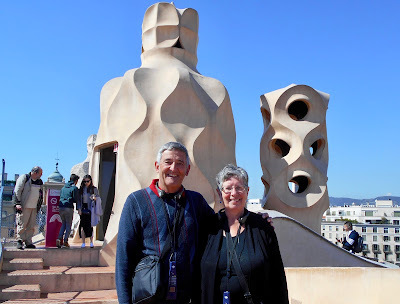 On our first visit to Barcelona in 2015 we explored Las Ramblas, Gaudi's La Familia Sagrada and Parc Guell (click link for pics and post) and this time around we made our first stop Gaudi's La Pedrera. 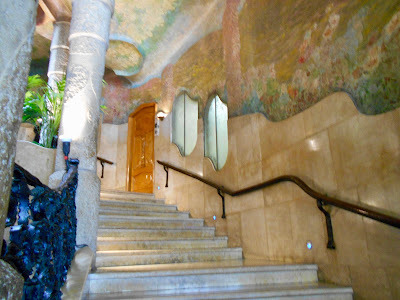 Gaudi designed and supervised construction of the building from 1906 through 1912. 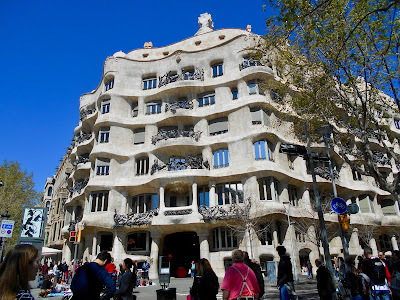 Casa Mila, as it was originally named (after the owner), was built as two apartments with separate entrances linked by two large inner courtyards. It is the roof, however, and its towering structures that most people are familiar with. 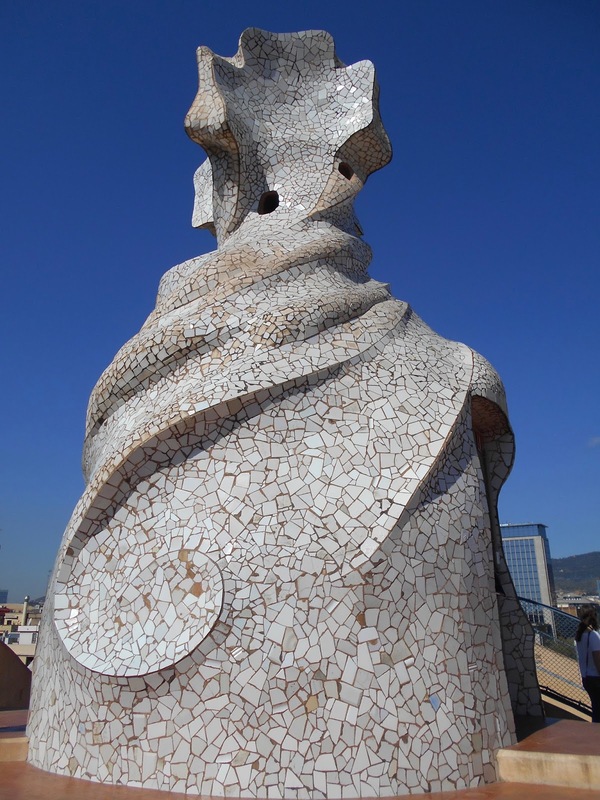 Gaudi took a boring flat surface and transformed it into a magical, inviting place with incredible views of the city. 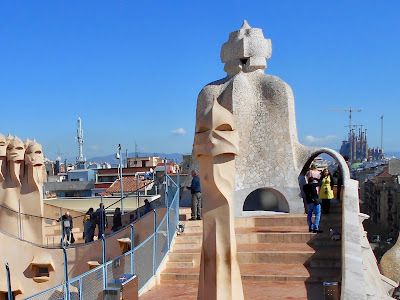 Visible off in the distance on the far right of the photo below is La Familia Sagrada Cathedral. 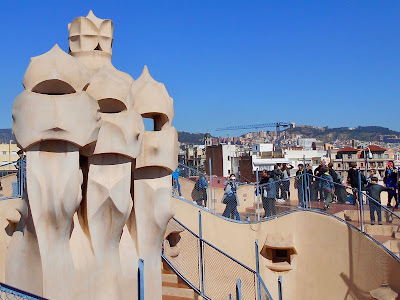 From the roof we walked down to the attic. 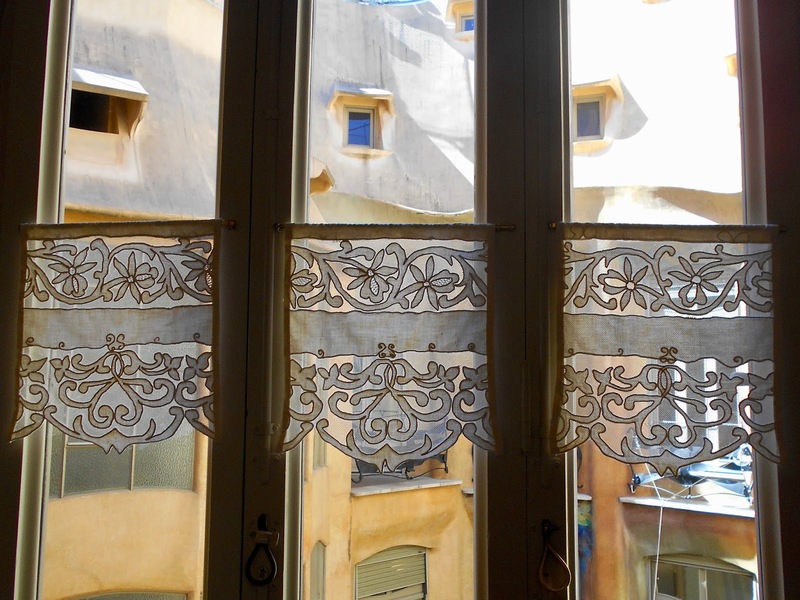 Gaudi believed it should be a usable space and originally it was used to hang laundry. Now it is a museum. 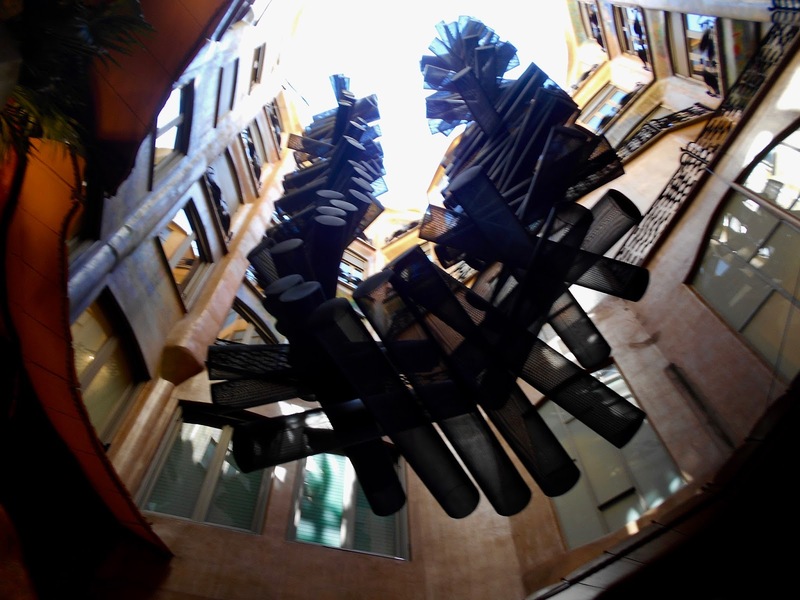 Included in the many displays is a model for La Predrera. 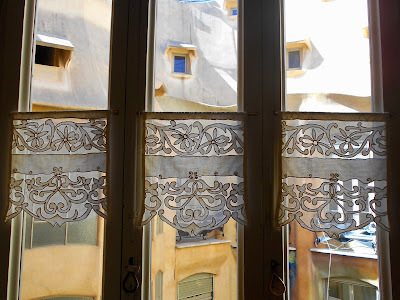 Gaudi designed every detail of the La Pedrera, including the ceramic floor tiles. 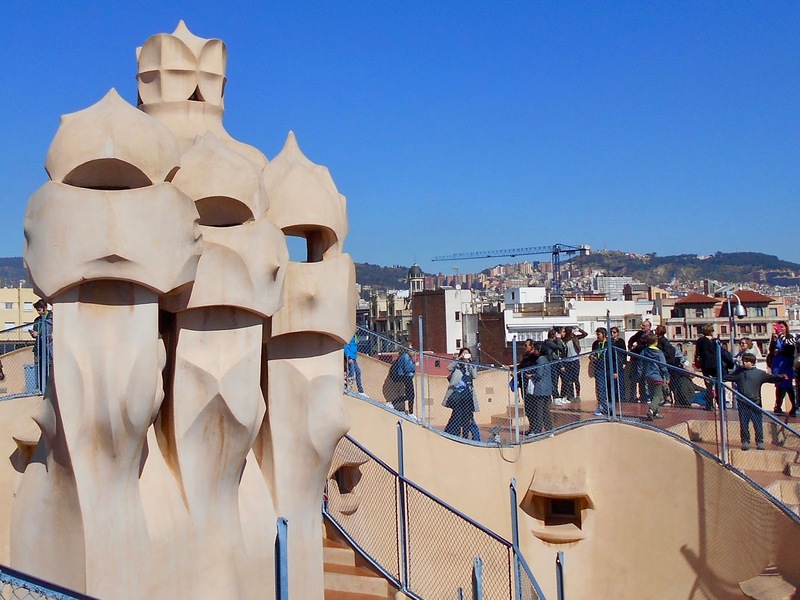 Tiles with the same design now grace the sidewalks around the building. He also designed wooden furniture to be used inside the apartments. 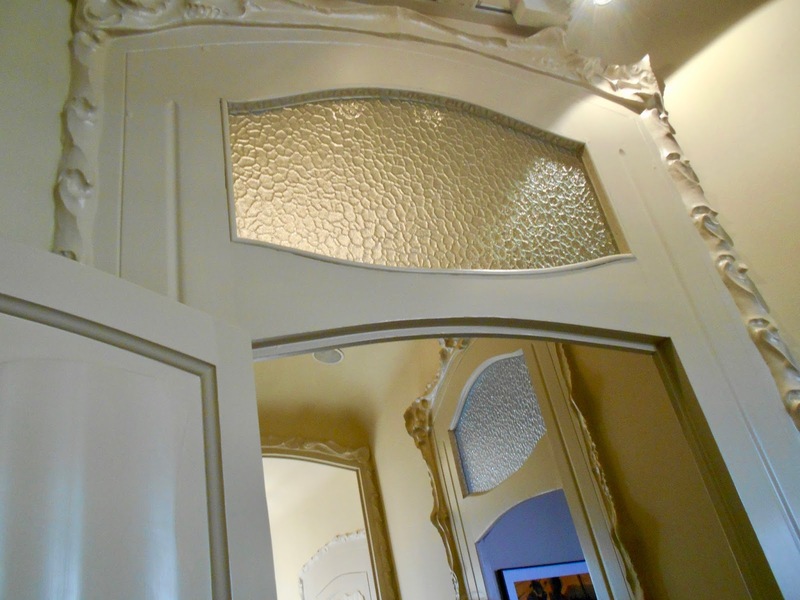 One of the apartments on the top floor is now a permanent exhibition space that showcases its spacious ceilings and whimsical design elements. 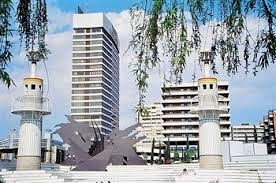 The furnishing are appropriate for the time frame in which it was built. Gaudi's design aspects went further than furnishings and the flowing or organic exterior and interior. 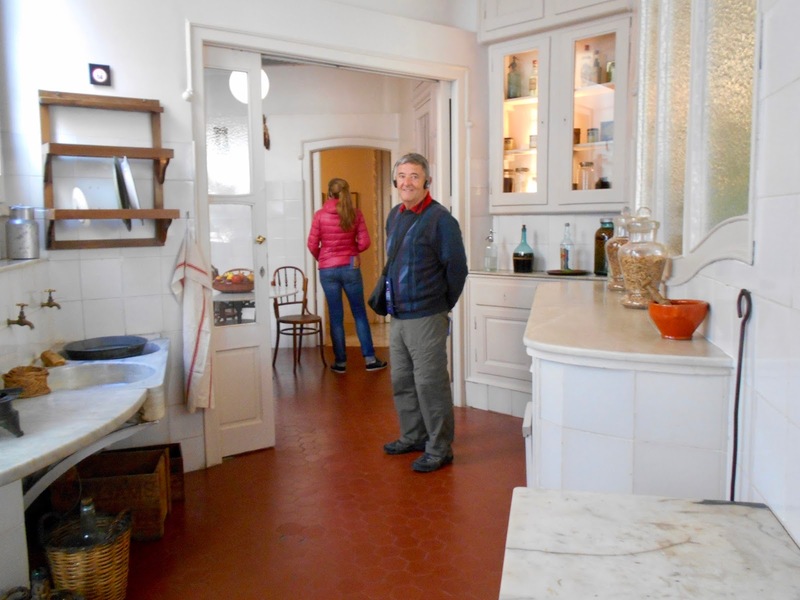 He believed a communal lifestyle is both healthy and important to everyone's well being. 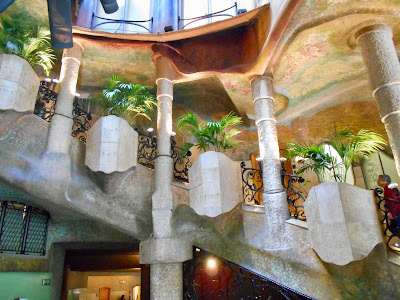 With that in mind he limited access to the elevators to every other floor, thereby forcing people to walk up or down one flight of stairs and interact with their neighbours. 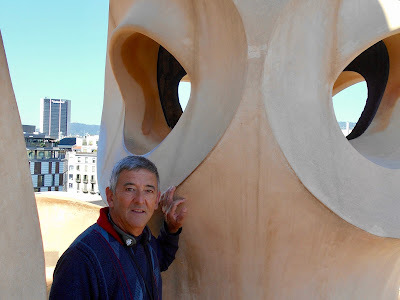 The most fascinating thing about La Pedrera is that it is not solely a monument to Gaudi's artistry and vision. More than one hundred years after its construction it remains home to some very fortunate Barcelonians.